Festivals, events, shopping, distilleries, anniversaries, + more. 37 Cedar Restaurant & Bar – NOW OPEN – Adding to the fare + flare of Cookeville’s historic WestSide cultural district, this new hot spot offers foodies, craft brew & cocktail-lovers a new fave restaurant retreat. Belle Ridge Retreat – NOW OPEN – Camping, hiking and ATV destination in Monterey. Candlewood Suites – Summer 2019 – Featuring 7 traditional rooms and 84 suites, the hotel will offer advanced technology from check-in to teleconferencing options. Colorblind-less Viewfinders – 3 nearby parks now offer travelers afflicted by color blindness, the latest technology lenses for alleviating red-green color deficiencies and allowing them to see the true scenic beauty of the area. Local locations include: Big South Fork National River & Recreation Area, Standing Stone State Park, and Fall Creek Falls State Park. Cookeville Escape – NOW OPEN – The first of its kind in the Upper Cumberland. Couture by Tess Bridal Boutique - Fall 2019 - Setting the stage for custom, luxurious, yet affordable wedding gowns, Couture by Tess will be located in the heart of Cookeville's historic WestSide cultural district. Serving one bride at a time, by appointment only, this unique boutique focuses blends romantic and traditional creating the perfect combination for glam results. The Couture By Tess Bridal collection is produced in collaboration with Bruce Xia for Couture By Tess Bridal as well as other high end design fabricators. Crepe & Cream – NOW OPEN – sweets bar featuring rolled ice cream, crepes, and more. Dream Desserts Bakery, Monterey - NOW OPEN - A great new addition to to the local culinary scene, and specializing in custom special occasion cakes, cupcakes, cookies, donuts and more, this sweet shop offers up tasty travelers' treats. Holiday Inn Express & Suites – Summer 2019 – A first of its kind for Cookeville, this new lodging option will be the city’s first full-service hotel. With five floors of precast solid concrete, the hotel will boast 97 rooms, fitness center, 2,000 sq. ft. meeting room and a 2,000 sq. ft. lobby. An indoor/outdoor pool will provide year-round use. The facility will also unveil Cookeville’s first rooftop bar which will also feature breakfast from the hotel’s full-service restaurant. Infinite Entertainment – Spring 2019 – Family-friendly entertainment center offering 45,000 sq. ft. featuring laser tag, bowling with on-lane dining, arcade, meeting space and more. The Lake at Meadow Creek Park, Monterey – NOW OPEN – A new road is complete, offering ease of access to the lake which is part of a 300+ acre park near downtown Monterey. Current amenities include fishing and non-motorized boating. Hiking trails are in progress, and bike trails are in the planning phase. Cliffs at Meadow Creek Park, Monterey - COMING SOON! - In addition to new access to this 300+ acre park and lake, Monterey is now 1 of 10 destinations in the U.S. to receive national rock climbing conservation grant and will soon add hiking trails + rock-climbing access, offering varying levels of climbing for guests. The Painted House Renovation/Expansion – One of Cookeville’s most eclectic, southern boutiques, featuring stylish home furnishings and more, has expanded upward to double their square footage and retail inventory. Rail WITH Trail – NOW OPEN – This route is no longer just for excursion trains. Walk, run, jog, bike, and explore more than 4 miles of outdoor pathway adjacent to the Tennessee Central Railway (LIVE RAIL). 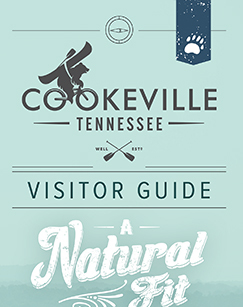 Trailheads are located at the Cookeville Depot Museum, Cinderella Park and the Algood Community Center. Managed by the Tennessee Central Heritage Trail Authority. SaltBox Inn & Stables – Summer 2019 – Expansion – Most recognized for serving as host to some of the region’s most spectacular weddings and events with accompanying lodging options, the SaltBox has added several new ceremony locations on their expansive farm property; a new “greenhouse” space and luxury barn loft to start. Floral and event rentals are also a new venture for the SaltBox. The attraction will also be expanding to offer more lodging for the leisure traveler with private and unique accommodations/suites throughout the SaltBox Farms property. Sunflower fields, a new horse barn and Tennessee Tree Sanctuary designation round out the accolades/updates for 2018-19. Sky High Sports - Fall 2019 - Cookeville will soon be home to a new indoor trampoline park with open jump, dodge ball, foam pits, basketball hoops, climbing walls, arcade games, ninja warrior course, kids court, and a soft play area children 2 and under, plus a full service concession stand. Soulcraft Coffee - CAFFIENATING SOON - Taking the #ckvlcoffee scene to new levels, Soulcraft Coffee will soon park the coffee truck for a bit to brew up caffienated creations from their new storefront in the heart of Cookeville's WestSide Cultural District. With traditional javas along with unique blended brews, this coffee crew is grinding up goodness. Sulfur Ridge – NOW OPEN – Escape to nature as well as luxury with a stay at Sulfur Ridge, a unique treehouse bed and breakfast. Upscale, retro glamping in restored-vintage campers also available (April) at this wooded retreat in Cookeville. The Shoppes at Eagle Pointe – NOW OPEN – 250,000 square feet of retail space on 42 acres at a cost of $45 million. 1,200 parking spaces. The Shoppes on South Jefferson – NOW OPEN –18,600 square feet of retail space along one of Cookeville’s busiest thoroughfares. 120 parking spaces. Tennessee Legend Distillery at Maddux Place, Cookeville – NOW OPEN – Headquartered in East Tennessee, Tennessee Legend Distillery has expanded. Now located on Cookeville's historic downtown square, the new sipping shop will offer free tastings and production/bottling onsite of moonshine, whiskey, bourbon, vodka, rum and cream liqueurs. Tennessee Music Pathways – A state-wide driving tour program highlighting well-known and possibly unknown Tennessee music events, locations and stories. The Tennessee Music Pathway will also promote the world-renowned live music scene present in the state of Tennessee. 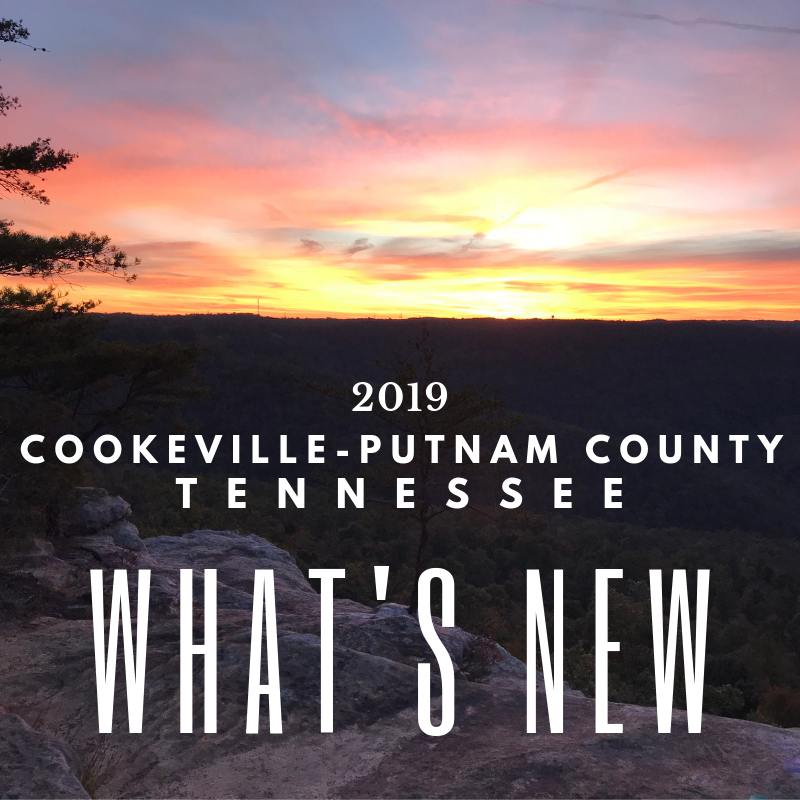 Cookeville TMP locations in Phase 1: Cookeville Performing Arts Center/Dogwood Park Pavilion and Muddy Roots Music Festival. Vintage Planet – NOW OPEN – Whether selling a prized family heirloom, buying your first classic car, or just visiting for the love of viewing a 12,000 sq. ft., climate-controlled garage filled with nostalgia and international flair, Vintage Planet is a true destination. Visible from I-40, their new showroom and service center offer ease of access for travelers. Hosting special events like “Cookeville Cars & Coffee” or “British & European Car Picnics,” VP creates experiences for locals and guests alike. Wall of Books, Cookeville - Summer 2019 - This new downtown book seller will buy, trade, & sell. A perfect place for books and educational toys. Window Cliffs is Tennessee’s newest designated natural area. Adjacent to Burgess Falls State Park, Window Cliffs is a 100-acre outdoor oasis. A strenuous 4-mile roundtrip hike rewards guests with spectacular views of the unique geologic "windows" formed in the limestone cliffs, a Cane Creek oxbow, and the picturesque Window Cliffs Falls. Nearby Outdoor Destination Protected - Nashville-based Bridgestone Americas donates 5,763 acres in White County to The Nature Conservancy in Tennessee. Cookeville will host the National Speleological Society’s 2019 National Caving Convention, June 17-21. With the area being home to the highest density of Tennessee’s more than 10,000 caves, the NSS thought Cookeville an ideal location for their educational seminars, scientific research presentations, and hands-on cave exploration. Estimated 1,500 attendees. Set for July 26-28, Cookeville will serve as host as the nation’s premier amateur hillclimb event locates to Tennessee. The American Motorcyclist Association will bring the 2019 AMA Hillclimb Grand Championship to the state for the first time. The adrenaline-filled weekend will take place at Middle Tennessee Dragway, just outside of downtown Cookeville and only an hour east of Nashville. Adjacent to the popular IHRA-sanctioned drag strip is an incline to challenge even the most talented climbers. Pops & Gumdrops – Cookeville’s premier candy shop celebrates it's One Year Anniversary. The sweetest place in town. Popcorn. Edible cookie dough. Candy. Muddy Roots Music Festival will celebrate its 10th anniversary in 2019. Named a top festival by both Rolling Stone and Garden & Gun, experience three days of music, camping, vintage cars, vendors, and pinups. From punk to traditional country, guests will find something (if not everything) to love. The charming small town of Monterey celebrates the 40th Anniversary of Standing Stone Day in 2019. This annual fall event celebrates the town’s rich history from Native American heritage and the “laying of the wreath & tomahawk” to exploring downtown’s Civil War history. The festival will also offer a parade, arts, crafts and food vendors, antique cars and will welcome hundreds of riders to town as a train excursion arrives from Nashville.